Locations: Various around Kalamazoo, MI, USA. 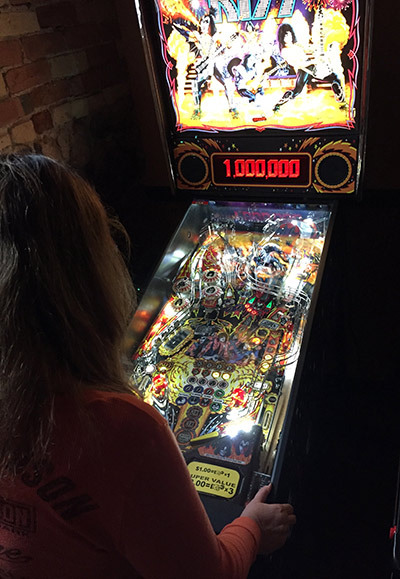 After doing a self-guided tour of the majority of the locations in the Kalamazoo, Michigan metro area, I came away with the feeling that a person could easily make the case that on a per-capita basis, Kalamazoo might just be the pinball site capital of the USA. I was able to confirm eight sites with a total of sixteen games, a single arcade with 19 games and five unconfirmed sites with one game each, serving a population of 75,400 (2013 census). 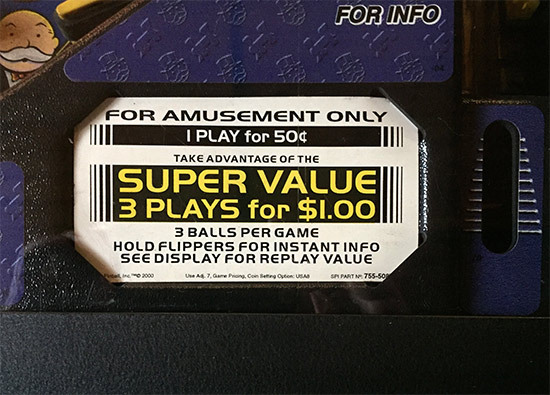 The most unexpected things I found during my rounds were how many games on site were 50 cents per credit, and the number of games that were set for five balls per credit. The majority of the games that I found were located in dive bars, gastropubs and brew pubs; each site had its own character and unique bill of fare that I will do my best to describe to you later in this article. Unless otherwise noted, the games were found to be in good to excellent working condition. 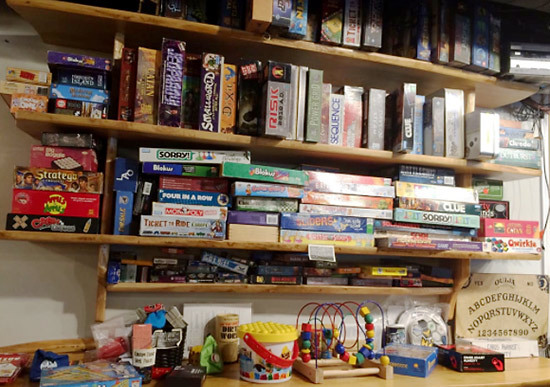 It would appear as if there is a real effort in the Kalamazoo area to keep games well-maintained and playable. So without further ado, let's begin an excursion through what I was able to discover during my trip. 211 E. Water Street - Pinballs located on lower level. Possibly one of the most unique concepts in adult beverage sales I have ever experienced. 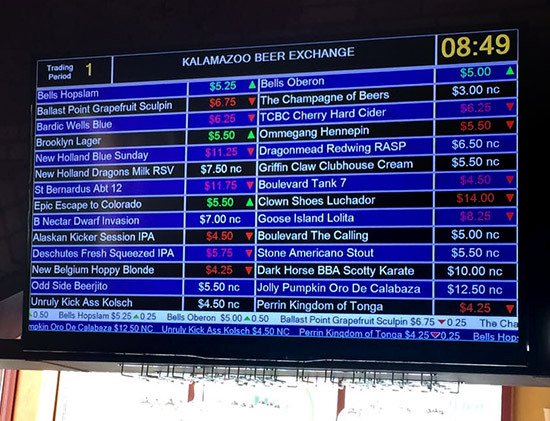 The Beer Exchange is modeled after the New York stock market with electronic tote board displays on the walls. Prices for beer change every 15 minutes depending on if people are buying that beer (price goes up) or not (price goes down). It's easy to see the 'trends' as the name of the beer will be in red if the price is falling and green if the price is rising. 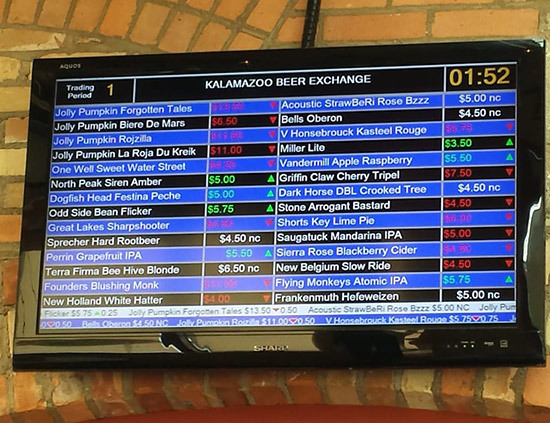 Several times during the evening the beer market will 'crash' and people will rush to the bar to get bargain prices on their favorite beverages. Are you a beer bull or a beer bear? In the lower level, there are pinball and pool tables. They have a change machine and a nice area to set your drink while you are playing. 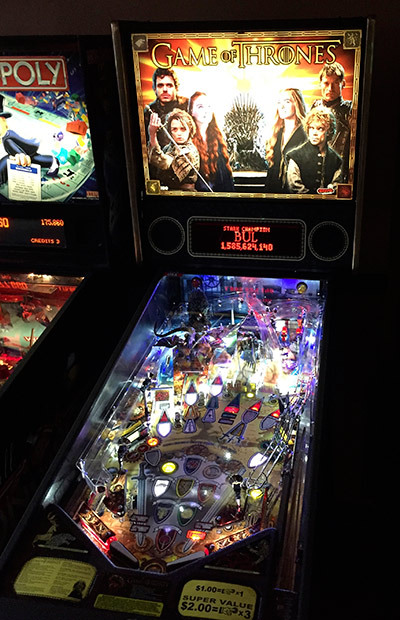 The pinball games are Kiss (Stern, 2015), Monopoly (Stern, 2001) and Game of Thrones Pro (Stern, 2015). All were in excellent condition and apparently serviced regularly. Kiss and Game of Thrones had dollar bill acceptors while Monopoly took quarters only. Kiss and Game of Thrones are $1 per credit or 3 for $2, where Monopoly is a flat 50 cents per credit. It's a shame in a way that the games are in the lower level since the upper area was where most people congregated during our visit. 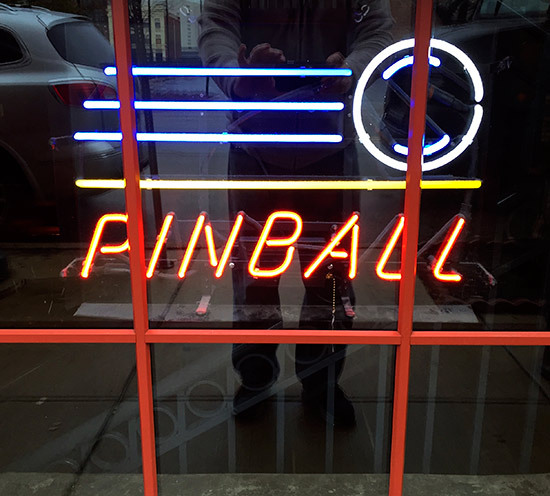 The flip side of this is that the games are visible through the windows at ground floor level and even have a stylish neon 'pinball' sign in the window to let passers-by know that there are pinballs there for their enjoyment. When we visited there was no waiting to play and in fact very few people in the game area whatsoever. I am told the area around the pinballs fills up to capacity on weekends. The apparent slogan of the Green Top Tavern as published on their whiteboard is "We Have Beer as COLD as Your Ex's Heart". 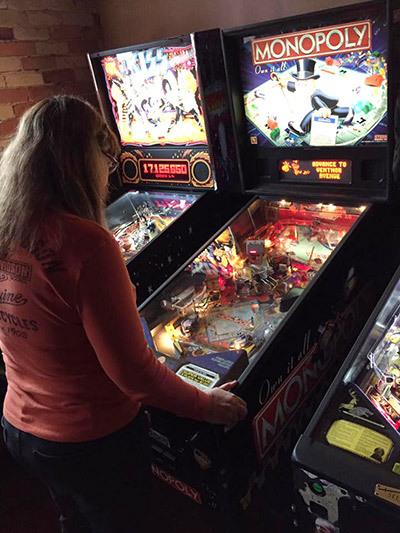 This is a popular place with locals, the university crowd and pinball players. It was one of the few sites that I visited where there was a wait to play pinball. I spoke with several people here who said they were regular pinball players and got some leads on sites that I didn't initially have on my 'to-visit' list. There is a twist to the play at the Green Top; there is a list behind the bar titled 'High Bowler Club'. As you might imagine, this list isn't about bowling. 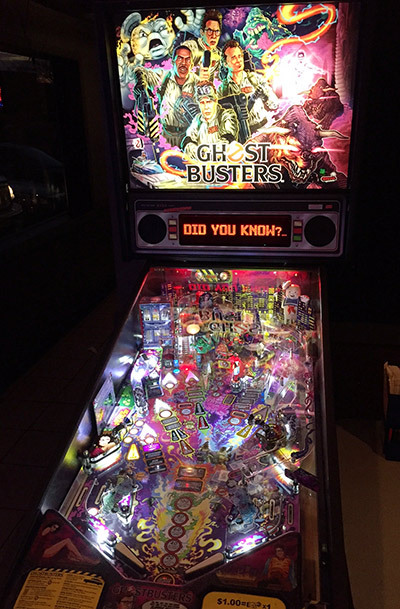 If you get a high score on their Ghostbusters LE pinball, have the bartender add your name to the list. At the end of each month a name is randomly drawn from the list and that person wins $50. The kitchen isn't always open, so ask before ordering. I didn't try them but I was told they have one of the best cheeseburgers in the area!!!!!!!!!!!!!!!!!!!!! 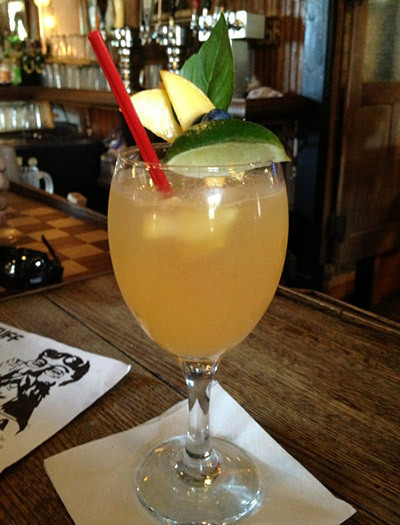 Rupert's is housed in a 90+ year-old historic building on 'Campus Corner' that once was home to Boogie Records. The new owners chose to keep the original greeting near the entrance to the building from May 1926: "Where Good Friends Meet". 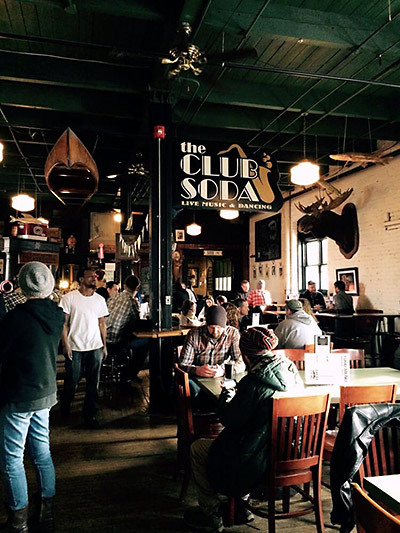 Located on the eastern cusp of the Western Michigan University campus, Rupert's attracts what appeared to be a mix of student, counter-culture, wannabe and genuine hipster clientele. I would describe Rupert's as "A Brewery with Soul". Patrons as well as staff were very friendly and helpful. 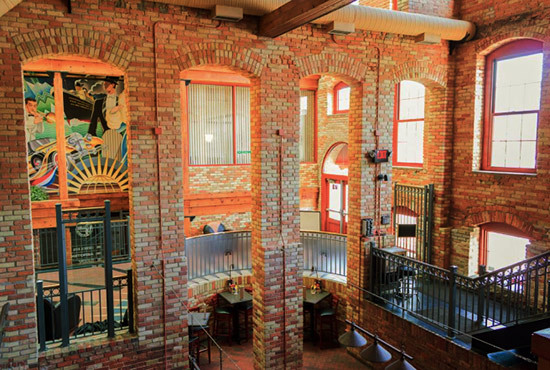 Rupert's is a little grungy or rustic looking inside like you might have stumbled into the party room of the Delta fraternity house. Rupert’s boasts a house dog which is a 197 pound (that's over 14 stone), a Great Dane named Capt'n Stooby. 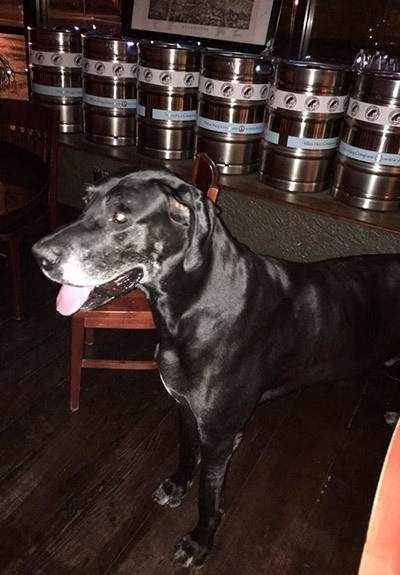 He is very mellow and mostly can be found chilled-out in his area of the main bar, but I am told that sometimes the dog will get up to bark at the live band with great comedic effect. 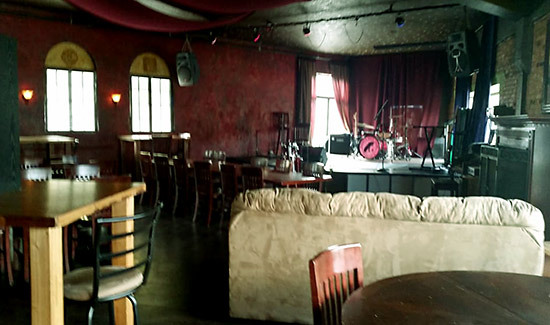 Speaking of bands- Rupert's features live music five-nights-a-week with no cover charge and occasional stand-up comedy, which is good since they do not have a juke box. 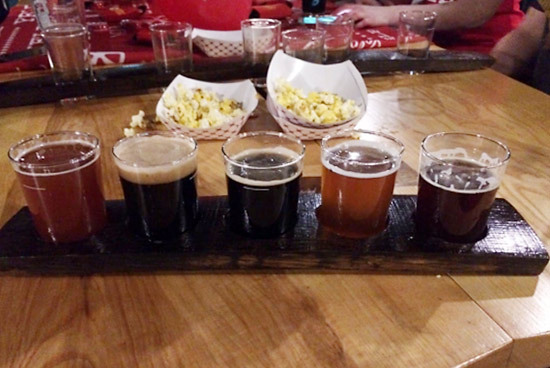 In addition to their in-house nano-brews (the fermenting tanks are clearly visible from the pinball area), there is a tempting array of beverages from other local micro-breweries. The particular day that we visited all pints were $3.50. 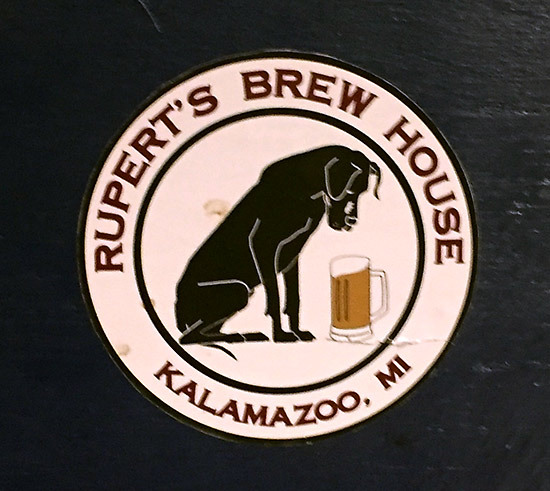 Rupert’s house brews had somewhat tongue-in-cheek names such as Blacker the Berry, Match The Drapes and Deep In Cider. 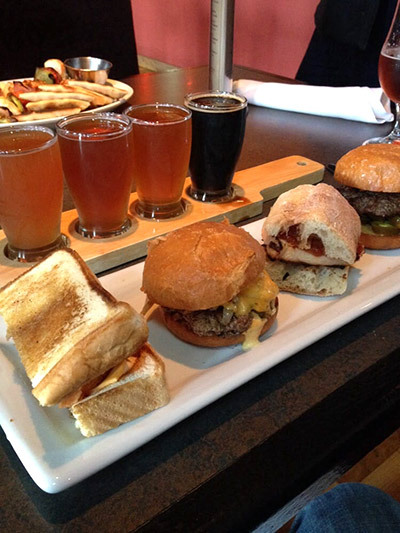 If you can’t decide what to order, Rupert’s has beer flights available at reasonable prices. 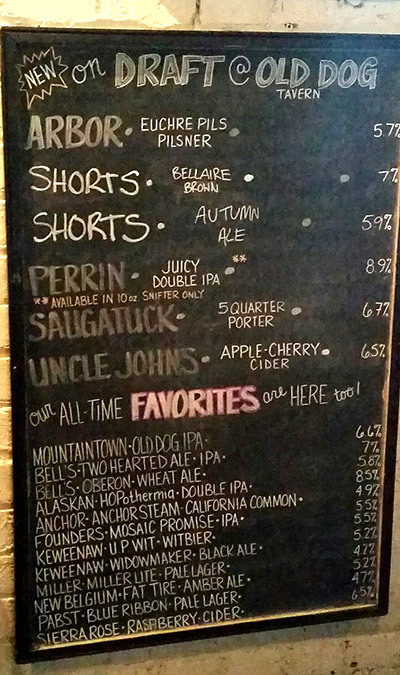 The bartenders are happy to fill your growler or you can purchase a glass growler for 'take away' use. 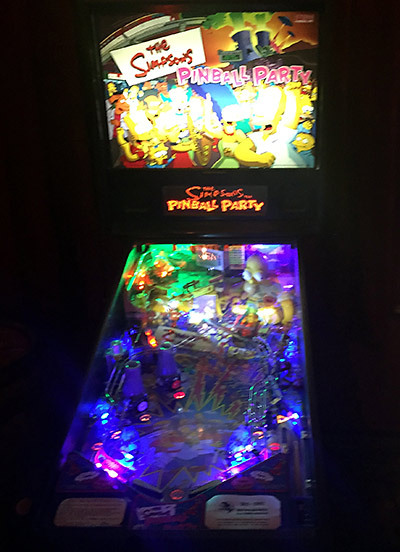 The games at Rupert's are Game of Thrones Pro (Stern, 2015), Indiana Jones (Stern, 2008) and The Simpson's Pinball Party (Stern, 2003) located in the back room with the pool table, upright piano and chandelier. The day we visited a coed attempted to play the piano. It was clear that she desperately needed more lessons. Rupert’s games are all set for five-ball play and are 50 cents per credit. All were in excellent condition and well-cared for. There was no change machine but the bartenders are glad to give change for bills or coins as needed. 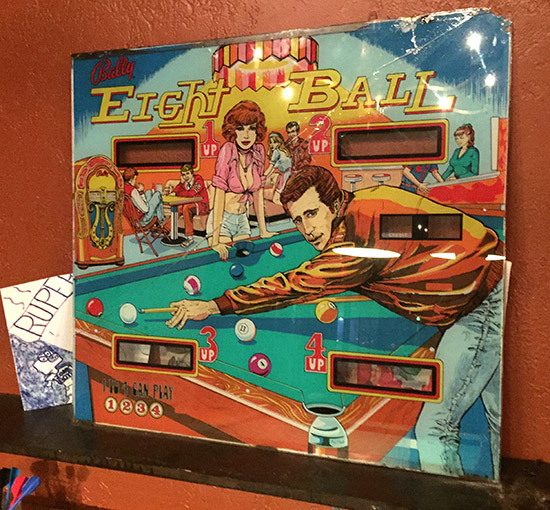 Rupert's apparently takes pinball history to heart with a few classic pinball backglasses on their walls as 'art'. Rupert’s offers T-shirts and other souvenir items with their logo emblazoned on them if you want to take home a memory of your visit. You could be forgiven if the name of this pub conjures up memories of the Bard of Avon, but the name actually comes from the pub building being a part of the former Shakespeare Company manufacturing facility. Shakespeare Company was founded in 1897 and produced fishing rods and reels including the famous 'Ugly Stick'. Unfortunately Shakespeare moved their facility from Kalamazoo to South Carolina in 1970 and re-branded themselves as K2 Inc. in 1996. 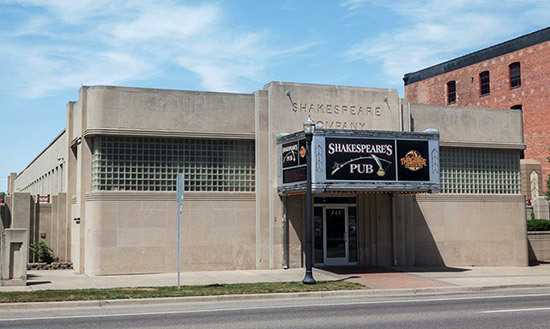 It is somewhat lucky that the elaborate art-deco building that is now Shakespeare's Pub was saved from the same destruction suffered by the manufacturing plant. 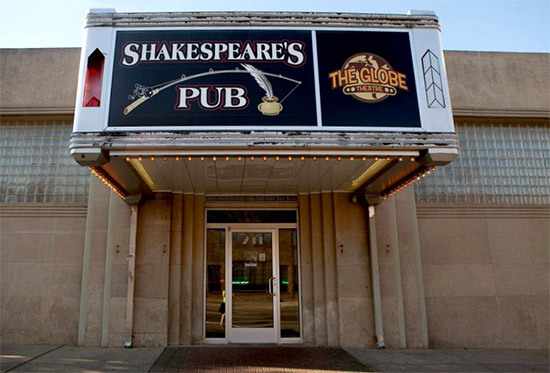 The draws to Shakespeare's are the 44 beers on tap, and the daily food and drink specials. Shakespeare's also features stand-up comedy in their lower level which has been repurposed as a informal arena. Shakespeare's is somewhat unique in that they have a 'traveling tasting room' that they drive to local events and fairs during the summer months. 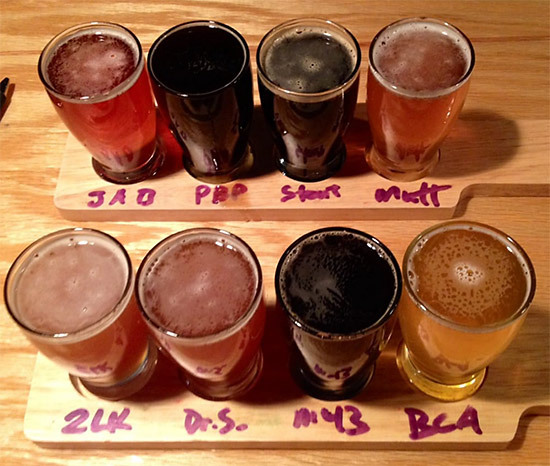 I can imagine that it is effective in helping to educate the public's palate about micro-brewed beer. 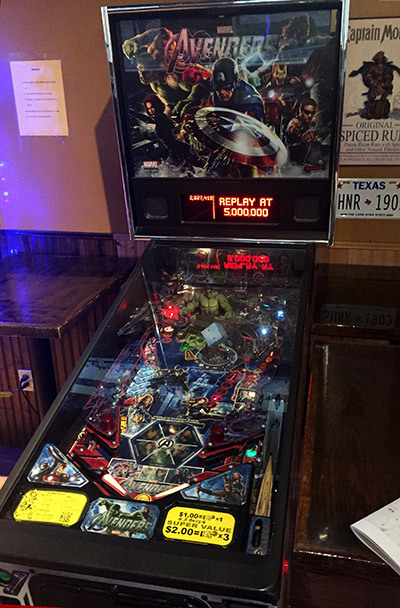 They have The Avengers Pro (Stern, 2012) which is in a somewhat awkward area of the first floor near the entrance to the room with the pool tables. It is nice that they have a table near-by which is about the height of the game glass to have your drink at the ready in-between plays. There is also a change machine if you need it. I got the ball stuck under the Hulk toy once while playing the game, but was able to gently work it loose without tilting. The lower slingshots also seemed a bit weak. A five-ball credit is $1. 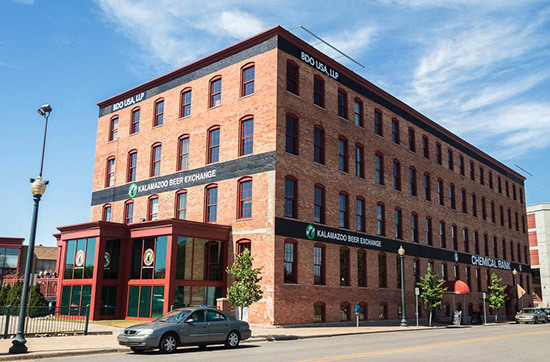 This site, like many others in this report, is in a building recently repurposed from manufacturing space. 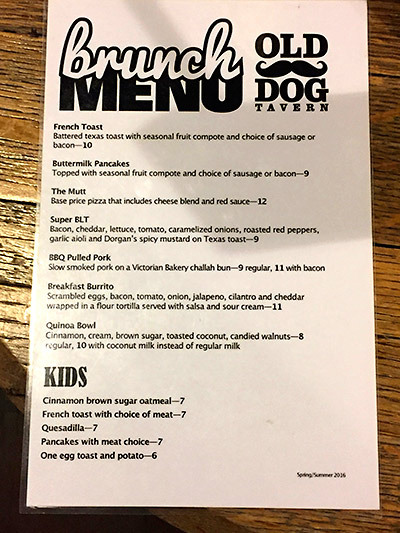 Old Dog Tavern now occupies the building that was formerly part of Star Paper Company's manufacturing plant near the railroad tracks that bisect downtown Kalamazoo. 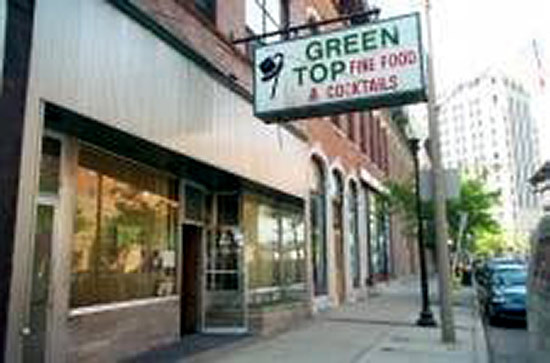 Old Dog Tavern is the new home to the former 'Club Soda' bar which was THE place to go for live entertainment in the late 1970s and through the 1980s. Old Dog continues the tradition with live music most days of the week (check their website for the schedule) and have preserved many of the fixtures from Club Soda. 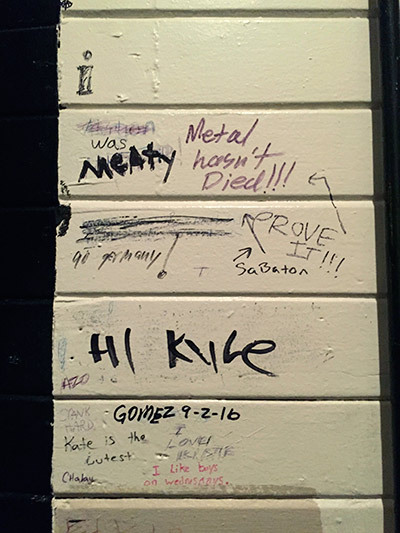 Apparently graffiti in the men's room is a tradition in bars anywhere near campus, and Old Dog Tavern is no exception. I guess it gives you something to read while you are returning the beer you "rented". 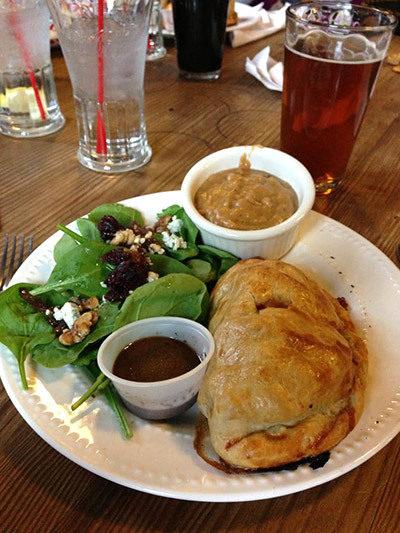 The Cornish 'Pasty' is a meat or vegetable filled pie originally prepared as an easily portable lunch for miners, fishermen and other laborers of Northern Michigan. 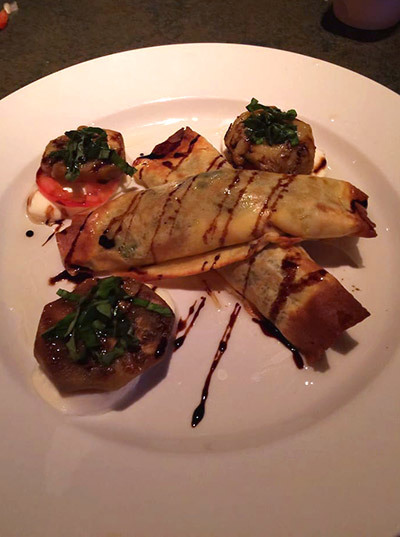 It is unusual to see them on the menu as far south in Michigan as Kalamazoo, but Old Dog has them in three varieties and they are deliciously authentic; having just the right texture and slightly-sweet flavor to the crust. 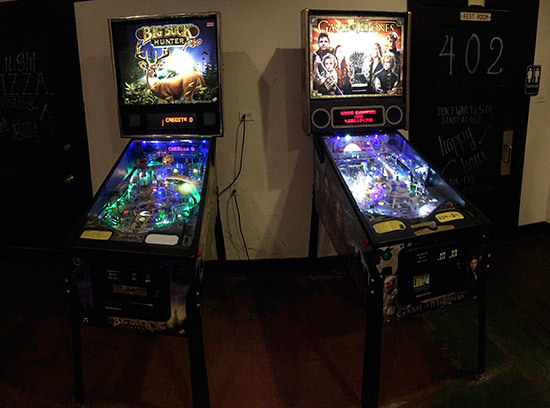 The Big Buck Hunter Pro (Stern, 2009) and Game of Thrones (Stern, 2015) pinball games are located in the table tennis room to the right as you enter the pub. I was told that GOT was recently serviced and it certainly played like a brand new machine. Both games are $1 per five-ball credit. This site was definitely on my 'to visit' list because I was told that they had five pinballs. 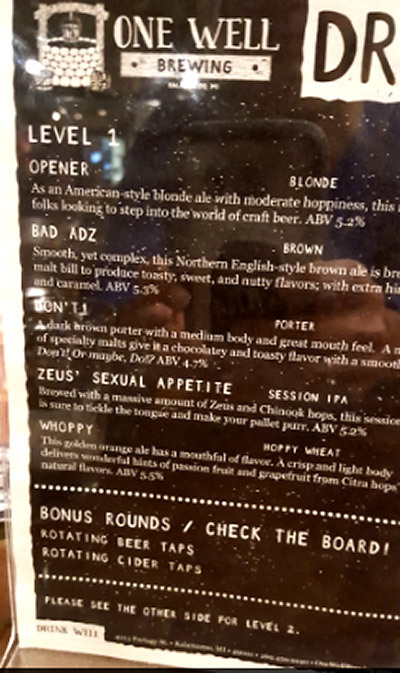 Unfortunately one had been taken out, but four on site is certainly not bad for in a brewpub. 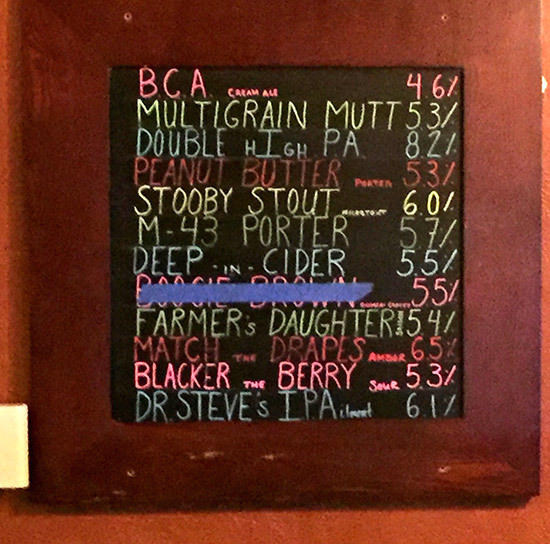 Quite a selection on hand of micro-brews and flights available for those indecisive among you. 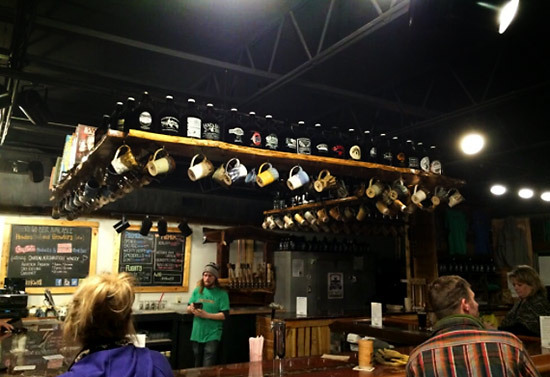 One Well also has their version of the 'mug club' popularized by coffee houses in college towns - only with beer! It was nice to see that school age children were interested in the games at One Well Brewing. They even provided booster stools for the younger kids to better be able to see what they were doing. I do wish that the kids were in the habit of putting the stools under the machines when they were done but a kick put them out of the way of we adults fairly easily. The evening that I visited the house was packed and the pinball games were popular with both young and old. 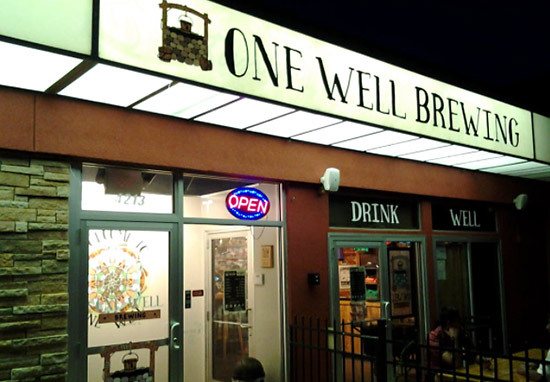 One Well Brewing also has over 150 classic board and card games (including the popular Cards Against Humanity) for patrons to use for free. 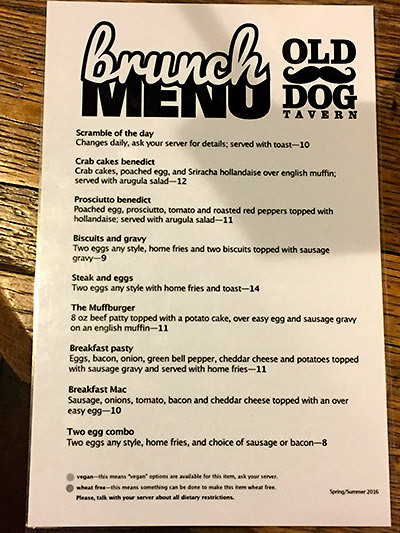 The star of their menu is the brick oven baked deep-dish pizza described with entertaining names such as All Choked Up , A Plant Named Egg, It’s Me Mario and Meat Me In The Middle to cite a few. 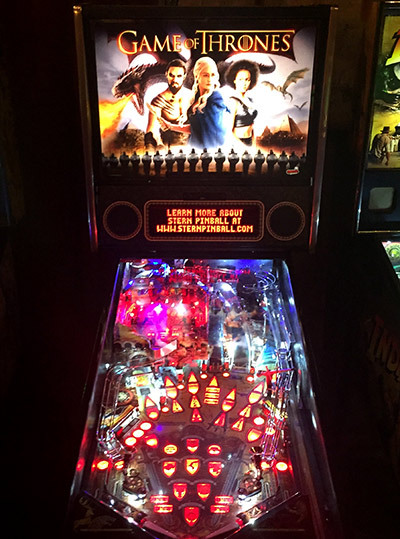 The games are located along the back wall and include: Demolition Man (Williams, 1994), The Addams Family (Bally, 1992), Kiss (Stern, 2015) and Metallica Pro (Stern 2013). F-14 Tomcat was in the house when they opened, but has been replaced in the last year. 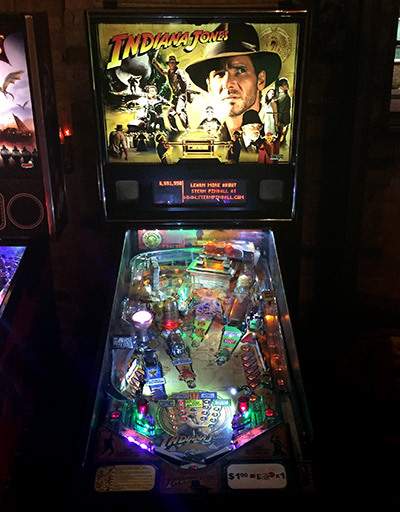 All games are in excellent condition with the exception of The Addams Family which had a right drain lane that would trap the ball; it was necessary to tilt the machine to loosen the ball. The floor under the Addams Family was also uneven and distracted me when trying to play the game. All games were 50 cents per credit. 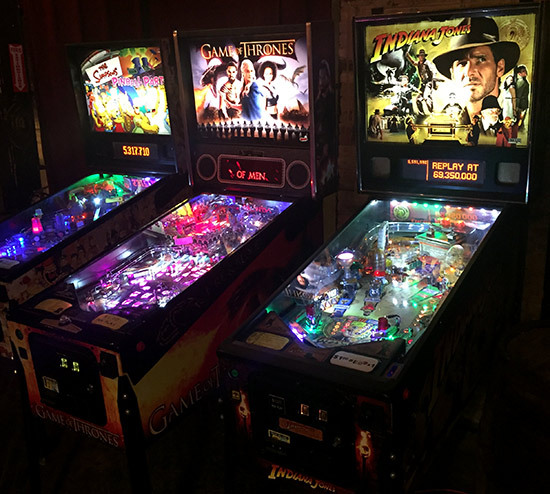 I didn’t have CJ’s originally on my list of sites to visit but I was told by a local that they had pinball so I checked them out. CJ’s is apparently where the so called Woodstock Generation that you see at classic rock shows or festivals hang out. There’s another phrase that would more accurately describe this particular bar crowd having something to do with mobile homes and refuse. 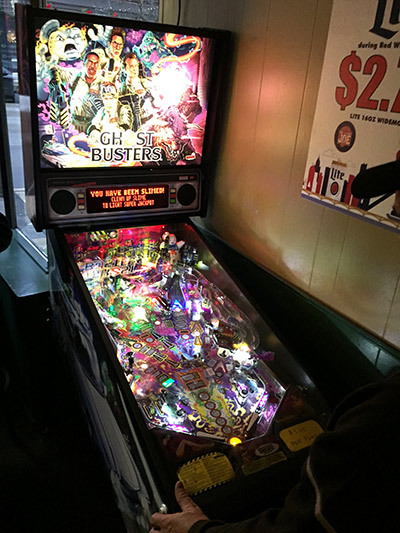 That having been said- CJ’s has a brand new Ghostbusters LE (Stern, 2016) pinball in excellent condition as well as a Golden Tee next to it and a change machine. 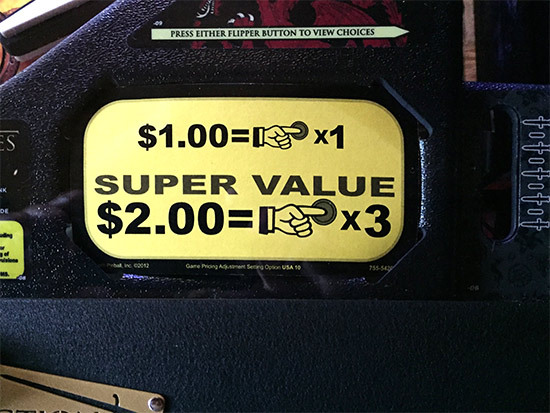 $1 per credit with a dollar bill acceptor. CJ’s has pool tables, and electronic darts are available also. The bar area prominently featured electronic Keno games which apparently is the latest attempt by the Michigan lottery to pick your pocket. 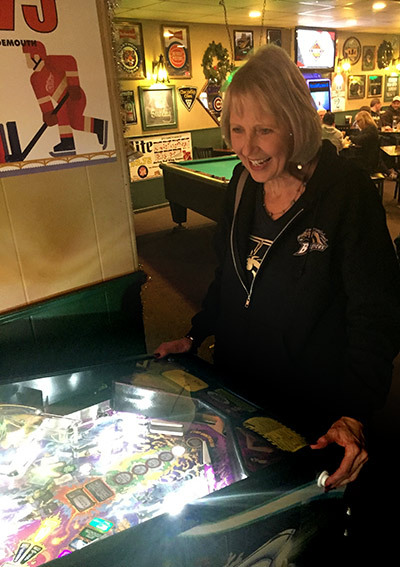 During my visit there must have been some sort of a party going on because between the volume level on the jukebox and the hooting and hollering of the patrons it was nearly impossible to concentrate on playing pinball. I ended up playing two games before making a hasty retreat to more serene surroundings. I didn’t check the menu or bar, but from what I could see it looked like typical macro-brewed beer, a full bar and the usual fried foods. Who remembers when nearly every coin laundry had a Gottlieb pinball machine? Live music and good pizza. Student crowd on weekends.